The offer has been placed by company HELTOS a.s.
Company HELTOS a.s. supplies desktop drills and drill presses for drilling, reaming and threading, and can also provide all repairs and servicing for them. 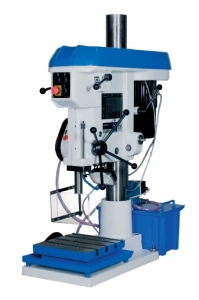 If you need to purchase a high-quality desktop drill or drill press, do not hesitate to contact the HELTOS a.s. company, which will supply drills with a fixed frame and then also provide servicing. We deliver a variety of high-quality drill presses and desktop drills which you will appreciate especially when cutting, drilling and reaming various threads. We provide all repairs and complex servicing of desktop drills and drill presses manufactured by TOS Svitavy, PKD Dačice and HELTOS Slavonice. You can choose from four repair variants depending on the degree of damage to the drill. We will be pleased to help you choose a drill and advise in case any repair is necessary.